Don Randall was a partner to Leo Fender when the legendary Fender company was founded in the 1940s. Randall was in charge of sales and distribution, and also came up with the names for many of Fender's early, legendary products, including the Broadcaster and Stratocaster guitars. Randall subsequently became vice president and general manager of the Fender Musical Instrument and Fender Sales divisions of CBS. In 1969 Randall left to found Randall Amplifiers. 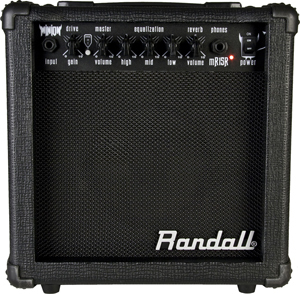 Randall Amplifiers was founded in 1970 in Irvine, CA. Now Randall Amplifiers has debuted the latest addition to their product line-up, the Minion Series, at Winter NAMM 2011. Aimed at entry level players, the Minion amps provide basic functions at an affordable price. Thanks to their headphone output, these pint-sized combos deliver great silent practice sound without sacrificing Randall tone, making them perfect for practicing just about anywhere. Whether you’re a beginner playing at home or a professional artist practicing on a tour bus, the Randall Minion Series combos are the ultimate guitarist's companions. Available in 10-watt, 15-watt or 15-watt with spring reverb versions, each practice amp offers two channels, volume and overdrive and traditional black cosmetics. The MR10 will retail for $89.98 and features a 5" speaker and 2-band EQ at 10 watts. The MR15 will retail for $104.98 and comes with an added Gain control, 3-band EQ, larger 6.5" speaker with 15 watts of power. The upgraded MR15R (pictured) adds in spring reverb and will retail for $134.98.